Just wanted to give everyone a quick update of where we're at with taking over Kingdoms CCG. We've had a bit of a delay taking over the day-to-day operations of the game, but we now have access to all of the tools, and will be ramping up this week. We know that after such a long hiatus that you are all waiting anxiously for new content and a shake up of the metagame. We do not have final dates for any changes yet, but have an overall plan that I can share with you. Hero revisions: We currently have revisions slated for 6 heroes. We're very excited to get these revisions into your hands. We have been watching the hero discussions daily and they have directly influenced the changes we're making. This will be a huge shake up to the meta. Nomad: We are hoping to get this long awaited hero into the game at this time. Two of his three abilities are well tested, and all of his art is ready to go. If not included in this release he will be released by the end of the year. Kingdom Packs: Kingdom Packs will now include cards from Rise and Tribes. Tournament Changes: We're going to review the current schedule and streamline it so that there is always one constructed and one limited format tournament being offered. Getting the Ganz logo into the game: Gotta make it official so that we can start marketing! 2) Set Release 1: Expected release: Mid to late December. As stated previously, this will be a 55 card set. The key reason that this game will take longer to release is that we need to get the art completed. We will be working with the original artists of Kingdoms CCG, as well as working with a second well-known studio to get this art done as quickly as possible. That said art does take time and we want it to impressive! As the art starts coming in, we will start spoiling cards from this set. 3) Steam Release: Late December or Early January 2015. Our goal is to have the game on Steam by the end of the year, and are confident that we can do it. This won't have much impact on you as a player except that you other than seeing a LOT more players to compete against. 4) Set Release 2: Expected Release: Early 2015. Another 55 card set that will act as a mirror of the first set. What do I mean by that? More will be revealed soon. Yes, that's six abilities. One from each of the six Kingdoms. 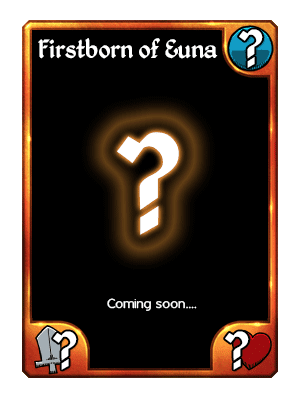 And the card will have card text as well... How will you get this card? 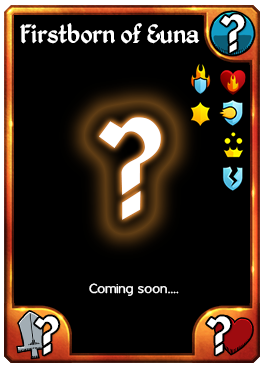 Anyone who plays the game between October 1, 2014 and the day that we release the card will receive it FREE. So if you know anyone who hasn't played in a while, let them know! My name is Karl Borst and I am the Creative Director for Ganz, the proud new owners of Kingdoms CCG. While this is my first post as myself, some of you will know me by my Kingdoms account name: EvilSquid. I began playing Kingdoms back in March 2013 and worked my way up to a spot in the top guild TAM where I battled fiercely for six months. I've put a ton of time and money (VIP Level 8) into Kingdoms and it is easily one of the best games I've ever played. After hearing that the game had been put on hiatus, Ganz and Antic opened discussions about the purchase of the game. As with many things, these conversations took some time, but they are now complete and we are extremely pleased to be the new owners and managers of this great game. Steam - After Kingdoms got greenlit earlier this year, getting the game onto Steam became our number one priority. Ganz has experience with Steam, having brought our kids MMO "Amazing World" to the platform a few months ago. Getting on Steam will dramatically expand our reach to bring new players into the game. And hey, the more players, the better. New Cards - You want them. We want them. As a player, I want them. Our strategy is going to be a little different from Antic's. Our plan is to release smaller sets, more often. Our first two booster sets will be just 55 cards, with later sets averaging about 100 cards. This will keep the game fresh and exciting, and keep the meta hopping. Hero Balancing - There are heroes that are rarely seen in competitive play and we want that to change. It is our goal to see every hero have strong builds that have a chance of winning a Standard tournament. To do so, we will be giving our weakest heroes a boost, and toning down the top tier slightly. While we understand that there will always be a Tier 1, we want the distance between Tier 1 and Tier 3 to be smaller. And we want your help for this! We will be engaging all of you to discuss the heroes that you most want to see improved. Marketing - Yes, marketing. Not as exciting as new cards, but just as important. It is a testament to the quality of this game that so many players have enjoyed the game, with almost no marketing. We want to bring in new players and bring back past players. With more players we'll have more competition, deeper guilds, and more tournaments. I have so much more that I'd like to discuss - Android play, improving the Standard format, improving crafting and yes, oh yes, expanding the single player campaign - but I'll keep those topics for another day. I will be posting in the forums as GANZ_Karl and will still be playing and chatting as EvilSquid. I look forward to discussing where you'd like to see the game go. I'd like to personally thank Fredrik and Jeff for creating such an amazing game. We wouldn't be here without them. After a long hiatus it brings us great pleasure to announce some very exciting news for the Kingdoms universe. For quite some time Antic Entertainment has been searching for the ideal partner to take over Kingdoms CCG, as we felt we couldn’t adequately support it to the level we desired. As of today, Antic Entertainment has completed a sale of Kingdoms CCG with Ganz (http://www.ganz.com/). Ganz will take over the ownership of the game and the responsibility of ongoing development, live production and expansion of Kingdoms to Steam effective immediately. There will of course be some ramp up time for Ganz to get Kingdoms back to full steam, but this is great news and we are very excited for what the future has in store. Ganz will truly bring Kingdoms to the next level. Antic Entertainment would like to thank all of our loyal fans and supporters for sticking with us over the years and contributing to the great Kingdoms community that has developed. We wish you all the best and happy Battling!